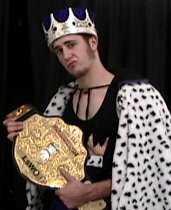 Welcome to the official home page of midwest wrestling indy star, Kenny the King. Kenny is truly one of the best cruiserweights in the state of Michigan. The proof is in the package, and Kenny the King has the package to prove it. Kenny reigns as both the Lakeshore Wrestling Organization and International Wrestling Organization cruiserweight champion. Enjoy the website of Kenny the King, and SIGN THE GUEST BOOK!